6th and 7th grade students do not like to write equations for word problems. They just want to scratch out some calculations and give me their answer. Often, their answer is correct, but I would love for them to develop how to write an equation from a word problem at this level. 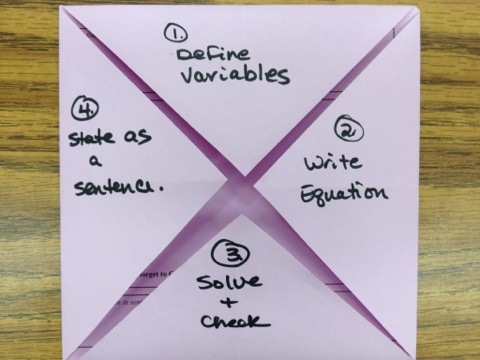 I made this four step foldable to visually slow them down, and illustrate the steps they need to take when writing an equation from a word problem. The students caught on very easily when I did this in class with them. For the first time, they seemed to realize that they needed to complete several steps in order to solve a word problem (by writing an equation). I emphasized the importance of the equation. 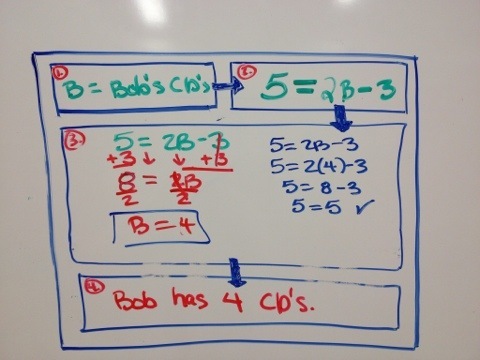 This is the example that I wrote on the board to illustrate how to write an equation and solve it. PDF and Word File of the Foldable. Sorry for the upside down picture! I was trying to post using my iPad. That app needs work! 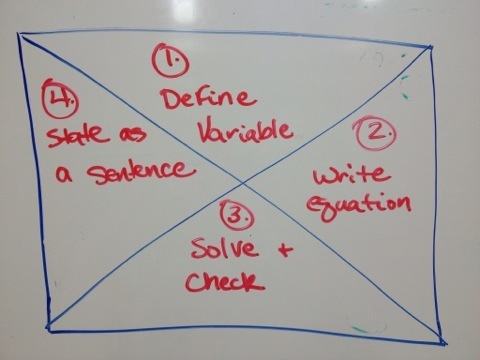 This entry was posted in Foldables, Notebook, Pre-Algebra and tagged algebra, equations, foldable, linear by I Speak Math. Bookmark the permalink. You must be reading my mind! I’m preparing to reteach this next week as our formatives indicated writing expressions/equations as an area for improvement. 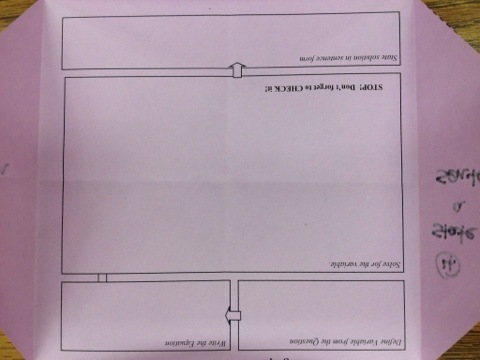 I LOVE THIS FOLDABLE and will unabashedly steal and use it in my classroom next week. Thanks! I use so many things that I find online. I love that other teachers share so many ideas, worksheets, and even power points! The web is a wonderful thing! My school just had an expensive presenter providing graphic organizer concepts, but I missed it at another meeting. Furthermore, this is what my class is working on right now, and this will put it all together. No doubt in my mind that I’ll be using this next week. Thank you again for a good tool and killer timing. Pieces complete, I’ll try to post about this on my blog (www.analoguesrevolt.com) as a fine, low tech example of what I truly enjoy doing in my class. Thanks again!